The clay bar is a must for anyone who wants silky smooth paint. What does clay have to do with your car? The clay bar is an amazing product that still incites heated debates among zealous enthusiasts as to exactly how the process works. Personally, it doesn't really matter how it works, I just know that it does work and that is what is important. Anyone unfamiliar with using the surface prep bar, commonly called detailing clay, is in for a real treat. This little piece of firm, "Play-doh" like wonder is the answer to silky smooth paint on your car. Having been in the world of professional auto detailing for over two decades, I actually had to function in the world at the beginning of my career without the benefits of the clay bar for cars. The surface preparation bar commonly referred to as detailing clay, is a tool of the professional auto detailer that has no equal! Despite surface prep bars having been around over 15 years, there are still many people unfamiliar with these amazing wonders of "interesting" material. Also referred to as detailing clay or surface prep bar. For the removal of paint contaminates that normal washing, waxing, and polishing won't remove. Should be part of regular maintenance. The are very few areas of detailing that cause as much amazement and strong positive reviews like the subject of detailing clay! If you have never heard of this amazing product until now, or perhaps have been sitting on the fence, I strongly recommend you take a little time to become an informed and educated consumer and car owner. The positive reaction experienced by any first-time user is an experience that must be witnessed first hand as words will not serve it justly. So take a little time to read these clay bar reviews to understand the critical role this tool of the trade plays in proper car paint care. This section is a good place to start. Follow any of the following links below to start the process. Understanding just how detailing clay works and the process behind this wonder. See and read the different reviews of the detailing clay. 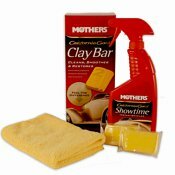 Detailing clay kits offer an economical way to sample other products along with the surface prep bar from the different manufacturers. See the review on this popular choice of kits from Mothers. Everything you wanted to know about detailing clay including the what, the why, and the how, and none of the minutia that is of no concern to most people...unless of course you thrive on mundane facts and technical data. If you are one of those people, then I guess you are out of luck.